being MVP: KMN Home: Drawer Decor & Giveaway! KMN Home: Drawer Decor & Giveaway! Since moving into our new home I have been trying to be a bit more organized and less cluttered. I am trying to avoid the dreaded "free for all" drawer in the kitchen and was excited to receive the DrawerDecor Starter Kit from KMN Home. The DrawerDecor is an ingenious product that essentially allows one to organize drawers with ease. The use is not limited to kitchen drawers but can also be used for the office, tools and more. It comes with 1 basemat, 5 long divitz, 5 short divitz and 5 triangle divitz. The basemat is made of a non-slip silicone that can be cut to drawer size. Since I placed one mat in an extra large drawer and the other in a large drawer, they did not have to be cut. The other drawer was standard size in the island and there was a little overage of the mat up the sides but I kind of like that. The mat is also fantastic as a stand alone drawer liner! As you can see, you can use this drawer organization system for pretty much any utensil of any shape and size. Things stay put and no more clutter! The Divitz are fantastic because they are repositionable without the use of any sort of sticky material i.e. tape or glue. You just need to lift up and place down in the area you want it. I chose to organize utensils so that they do not end up in a jumble and just placed long and short Divitz on each side of the main utensils and the triangle Divitz for keeping the roller in place as well as the measuring spoons. KMH Home offers the basemat and divitzs separately for purchase as well as an acrylic utensil organizer with additional pieces. Buy It: You can purchase the Deluxe Starter Kit for $25.95. Make sure to connect with KMN Home on Facebook and Twitter! One Winner will Receive a Drawer Decor Starter Kit! I really like how you can adjust and add to the system to make it more customizable for you! I learned that they sell eco-friendly bags also. They also sell Freedom bags to help end human trafficking. This looks like what I need to turn the kitchen junk drawer into something organized! I learned that they also have acrylic stackable organizers...a combination of the two systems could be really helpful. Every purchase of a Freedom Bag helps put a stop to human trafficking & gives these women a chance at freedom! It all began in 2005. Visited and learned Keith M. Nielson, CEO & co-Founder – As the namesake of KMN Home, Keith is an inventor and artist with a passion for creating new products and building a team into a great company. Neat company and made by women that left a profession they never chose in the first place. LOL! Love it! KMN home is a passion for creativity and design, to innovate, build stellar brands and enjoy life. I learned they have free shipping on orders over $50! Easy to clean and fits any drawer. The founders have known each other since the 4th grade! I learned that you can customize their products to fit in your own drawers by cutting the product down to the size of your drawer. Also they are not sold in any retail stores in CA. I learned that t their core is a passion for creativity. They have known each other since Mrs. Beattie's 4th grade class. I learned they have FREE SHIPPING ON ALL ORDERS OVER $50. I learned that the two owners were friends since 4th grade. I learned that kmnhome also has a blog. I learned that the company was started in 2005 by a group of friends. I learned that you can buy individual pieces to organize any drawer! I like their 12" Acrylic Stackable Organizer! they are using Kickstarter.com for their newest product launch! such a great way to get funding! They have free shipping on orders $50+. They are reasonably priced. 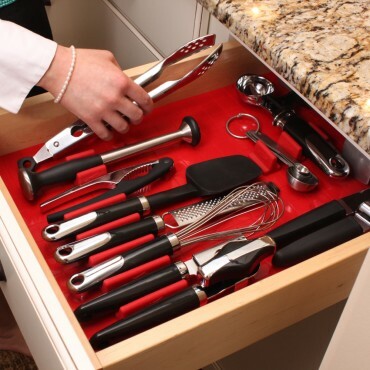 I'm new to messing around in the kitchen; I would love to own one of their drawer sets. i learned all orders over $50 get free shipping and that the owners are 2 friends that have known each other since 4th grade! I learned that they have eco friendly products and that this will fit any drawer size which is awesome because mine are shaped so weird! What great products! Such vibrant colors and the ability to fit the items in various sizes and shapes of any drawer. Finally, the ability to keep a drawer well organized to gain easier access to items that stay put in place. A bonus is the free shipping over $50, which you can use to order extra items as gifts that everyone will love. i learned that freedombags are sold to benefit the ending of human slavery! They currently have a Kickstarter campaign for smartIRON. The CEOs are friends from fourth grade! Love that. Kevin M. Vann, President & co-Founder – Kevin is a passionate entrepreneur and problem solver with a creative mind and detailed eye. He is also a first born, so while he likes to stay involved on the creative end, somebody has to keep the ship afloat. I learned that they have free shipping for all orders over 50 and I really like the 7-Piece Acrylic Utensil Organizer. I like the freedom bags. I learned that the Drawer Decor comes in different colors like Lime and Iris. I learned that the company is located in Traverse City, Michigan.